•	The purpose of the UDL is to provide a way to easily evaluate the Silicon Laboratories Integrated Development Environment (IDE) and the on-chip debug capabilities of the microcontrollers. 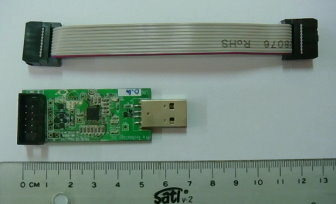 •	The UDL play the role as Silicon Laboratories USB Debugger. •	The UDL provides the interface between the PC’s USB port and the target device’s in-system debug/programming circuitry. •	The UDL only support Silicon Laboratories IDE version 2.82 and beyond version. •	The 10-pin debug ribbon cable connects the adapter to the target board and the target device’s debug interface. •	The UDL supports both Silicon Laboratories JTAG and C2 debug interfaces. •	Power is provided to the adapter from the USB connection to the PC. The UDL is capable of providing power to a circuit board via pin 10 of the DEBUG connector. •	Table 1 shows the pin definitions for the debug ribbon cable connector.